While I was looking around on my disk where to change the default Apache configuration after I found out that it is installed per default on OSX and I just needed to activate it in the System Preferences / Sharing panel. Click on Personal Web Sharing and you’re off. 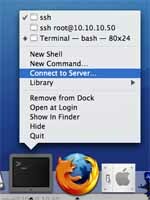 More information on how this works and how to configure Apache can be found here. That is not what this blog entry was about. Looking for the httpd.conf file where you configure your Apache webserver I found 2 entries in the filesystem. One was in /etc/httpd/ where you’d expect it as a regular Linux/Unix user but there is also one to be found in /private/etc/httpd/. So which was I to use ? After some Googling and looking closer at the directory entries, I found out that /etc is a symbolic link to /private/etc and therefore the same directory. So actually there is only one httpd.conf that is used. It seems that this has been done to provide compatibility between the unix roots and the OSX’s own layout of the filesystem which has its origin in NeXT. I was used to using Firefox as a browser on my PC, so I installed it directly on my Mac with my favorite plug-ins. But I ran into some strange behaviour when using the scroll ball in my Mighty Mouse. When scrolling horizontal the previous page was loaded. It looked like the forward and backward browser buttons where linked to the horizontal movement of the scroll ball. This wasn’t what I expected and started looking around to see if this could be fixed. Horizontal scrolling worked like a charm in Safari and it should work in Firefox. If you do this you will notice that you will stay on the same page when scrolling horizontal and even better, the pages moves horizontal when it’s wider than your browser window, just like in Safari. 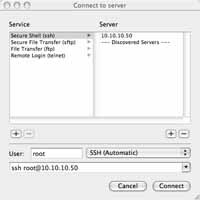 A small window appears where you can manage your SSH connections and connect to any server with a mouseclick, just like I used to do with Putty. I hope you like this solution as much as I do, if you have another good solution for this leave a comment. Well it had to happen at some point, but today was the happy day I went out to the local Apple dealer and bought my first Mac. It is a Mac Mini 1.42 Ghz, 512 Mb, 80 Gb HD, AE, BT and Superdrive. It works wonderfull, the 512 Mb seems to be enough, no real delays in using the software. But after running the memory monitor tool I can see that all the 512 Mb is fully used, so the next on my wishlist is a 1 Gb memory module. Because I still had a very old Eizo 21″ CRT which I bought a long time a go second hand it was also time to get myself a new monitor, and did I splash out there, I went for the 23″ cinema display. I’m sitting behind it now for a complete afternoon after buying it and I love it. The wide screen with 1920 pixels is magificent, you can have 2 or 3 apps running next to each other and have a complete overview. The only drawback is that it isn’t height adjustable, but I solved that by putting the stand on top of the Mac mini. The base on which the monitor rests is has almost the same footprint as the Mac mini, which in turn becomes even more invisible. I also bought myself a mighty mouse, as I did like the scroll wheel and the 2 mouse buttons on my PC. I’m using it now for a full afternoon but what I disliked mostly is that to engage the right mouse button you really have to remove your fingers from the left hand side of the mouse or it won’t work. Well, I couldn’t use one of the standard themes that came with WordPress. Although I’m not a designer by profession I really like to give my websites a personal touch, usually this is accomplished by looking at other peoples designs and copy the design elements I really like. The same here, I started of with the design “Connections” from Patricia Müller at VanillaMist.com as base design because of its relative simplicity. Changed the sidebar style, I didn’t like the striped filler at the bottom of each box so I removed it. Another style element I really liked is the date-tab I saw on the Wonkette.com site. I’ve tried, and I think I was succesfull, to incorporate that element into this design. I think it really works.